UConn closes out its regular season series with Northeastern and Merrimack over the weekend at XL Center. - Boston College will visit UMass Lowell for their third and final meeting of the regular-season series on Friday night, with the River Hawks leading, 1-0-1. The Eagles then take the ice at TD Garden on Monday night with #13 Northeastern in the Beanpot title game. This marks the first time that the two teams have met in the championship since 2014 when the Eagles skated away with a 4-1 victory. - The Eagles' rookies showed up big in their first Beanpot appearance, with Patrick Giles (Chevy Chase, Md.) netting his first collegiate goal to open the scoring and Jack McBain (Toronto, Ont.) striking just over half way through the final frame. The freshmen sent Boston College to its first appearance in the championship game since a 1-0 overtime victory over Boston University in 2016. - Northeastern dropped its third straight game on Friday night, falling to UMass Lowell, 3-1, before bouncing back to defeat Boston University, 2-1, in overtime in the opening round of the Beanpot. The Huskies look to defend their Beanpot tittle after being crowned champions for the first time in 30 years last season. - Rookie Tyler Madden (Deerfield Beach, Fla.) rose to the occasion in his first Beanpot, netting the game-winning goal under a minute into the extra frame to send the Huskies to their second straight appearance in the championship game. - The River Hawks enter the weekend riding an eight-game unbeaten streak, posting a 7-0-1 record in that span. In their only game last weekend, they defeated Northeastern, 3-1, in Boston. - Goaltender Tyler Wall (Leamington, Ont.) was named Hockey East Defensive Player of the Week for his efforts, turning away 26 of the 27 shots he faced from the Huskies to earn the victory. - UMass closes out two Hockey East regular season series this weekend as the Minutemen play host to Boston University on Friday night, before heading to UMass Lowell on Saturday. Massachusetts have a chance to sweep the Terriers and earn a split with the River Hawks. - Ty Farmer (O'Fallon, Mo.) earned Pro Ambitions Rookie of the Week honors after helping UMass to their first road win over the Terriers since 2012 last Friday. The freshman recorded two goals, including the game-winning tally, en route to his first multi-goal game of his career. - With the win at BU, Greg Carvel's team recorded its 20th victory of the season, just the third time in program history that the Minutemen have reached that milestone. The Minutemen also tied the program record for road wins in a season (9). - Boston University travels to UMass for their second and final regular season meeting of the year, before taking on Harvard in the third place game of the Beanpot Tournament. The Terriers and Crimson have already met once this season, playing to a 2-2 overtime draw on Jan. 8. 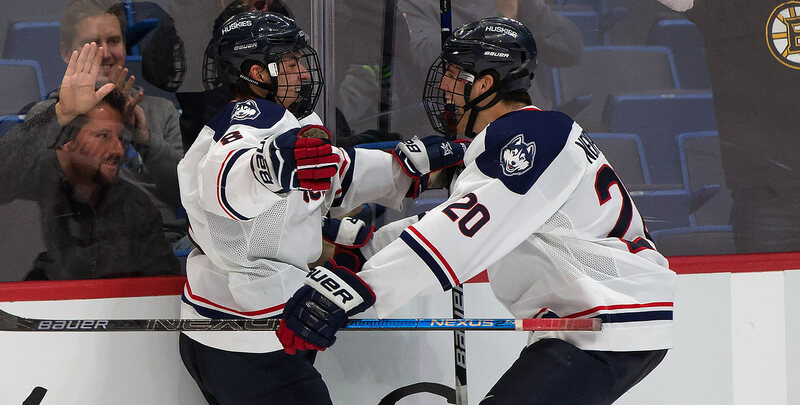 - UConn locks to snap a six-game winless streak as the Huskies close out their regular season series with Northeastern and Merrimack over the weekend. They fell to both teams in the first meetings of the year, coming up short in a 3-2 decision at Northeastern on Nov. 9, and dropping a 5-2 decision to the Warriors on Jan. 12. - The Huskies went 0-2-0 last week, falling to Sacred Heart, 2-1, in a midweek non-conference match up, before closing out their three game Hockey East series with Boston College on Friday in a 5-3 setback. - Warriors freshman Chase Gresock (Powell, Ohio) was named Pro Ambitions Rookie of the Month for January this week after tying for the national lead among all rookies with 10 points (5g, 5a). His two game-winners were also the most by any NCAA rookie over the past month. He had three separate three-game scoring streaks over that span and he had three different multi-point games along the way. - Maine plays host to Providence for a two-game home stand that marks the first time the teams have hit the ice together since last year's Hockey East Quarterfinals. The Friars defeated the Black Bears in two games to advance on to the Hockey East Semifinals in that tournament. - The Black Bears are back on home ice after a weekend split at long-time Hockey East rival New Hampshire. They dropped a 3-2 overtime decision in their first meeting, before rebounding to take game two, 5-3. - Maine's Mitchell Fossier (Alpharetta, Ga.) posted five points on the weekend at UNH, dishing out an assist in Friday's loss, before finding the back of the net twice and adding two assists in Saturday's victory. - Providence looks to right the ship after giving up three points in Hockey East play to Vermont on home ice over the weekend. The Friars fell to the visiting Catamounts, 3-1, on Friday, before playing to a 1-1 overtime draw on Saturday. - Vermont plays host to New Hampshire for two games this weekend to close out their three-game regular season Hockey East series. The Wildcats took the first tilt with a 3-2 overtime victory back on Oct. 27. - The Catamounts return to Gutterson Fieldhouse after pushing their unbeaten streak to four games with a win and a tie on the road at then-#11 Providence over the weekend. They defeated the Friars, 3-1, on Friday night and played to a 1-1 draw in overtime on Saturday. - Goaltender Stefanos Lekkas (Elburn, Ill.) earned Hockey East Player of the Week honors as the Catamounts took three points in Hockey East action from the Friars. The junior finished the weekend with 0.98 goals against average and .975 save percentage after turning away 79 attempts through the two games. - The Wildcats extended their own unbeaten streak to six games on Friday night when they defeated Maine, 3-2, in overtime, only to have it snapped when the Wildcats fell, 5-3, in their second meeting of the weekend with the Black Bears. - Ara Nazarian (Boxford, Mass.) pushed his point streak to five games after tallying four points on the weekend. He netted two goals, including the game winner, and dished out one assist in Friday night's overtime victory, before going on to add another assist in Saturday's loss.